The Parkers team provided a great service for my birthday at the end of July. Jenny was very helpful prior to the event, discussing the requirements and providing advice on the ideal quantities and timing. On the day, the team were cheerful throughout, despite awful weather, and were able to set up and serve within a short time of arriving. 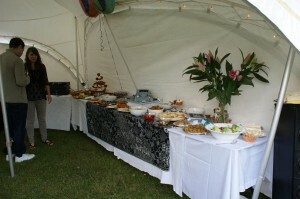 The food was excellent…hog roast, crackling, rolls, apple sauce and stuffed peppers for our vegetarian guests. Everyone commented on how they enjoyed what they’d eaten. Thank you, Parkers! Parkers are bespoke caterers and our specialist and highly mobile service covers all types of special event including Weddings, Birthdays, Christenings, Anniversaries, Garden Parties and any other special occasions. Our bespoke catering service offers the very best food using top quality produce designed and created according to your requirements. Working alongside our sister company, Jenny Johnson Catering, we can help you make your event truly memorable. With a rapidly growing portfolio of satisfied clients we have every confidence that we can meet your every expectation and ensure that our catering service is talked about for all the right reasons. Bespoke means that we will create our menus to suit your every requirement! We have a fast track booking service and can often fit in late bookings and short notice commissions so please contact us on 07940 364028 for menus and a fast quote! So we look forward to your call with your requirements and our talented staff will certainly be on hand to help you with your planning every aspect of your day.